Reporters Without Borders is very disappointed by President Joko “Jokowi” Widodo’s performance as regards freedom of information and media freedom during his first year in office. “Despite the democratic hopes raised by his election, Joko Widodo’s presidency is far from meeting expectations with regard to access to information,” said Benjamin Ismaïl, the head of the Reporters Without Borders Asia-Pacific desk. The former governor of Jakarta, Jokowi began his term well. His inauguration on 20 October 2014 was followed a few days later by the release of French journalists Valentine Bourrat and Thomas Dandois. Bourrat and Dandois had fallen victim to Indonesia’s restrictive practices in West Papua (the western half of the island of New Guinea) and were sentenced to two and a half months in prison for violating Indonesia’s draconian immigration laws by doing a report there after entering the country on tourist visas. Their fixer, Areki Wanimbo, was only released after being held for eight months. Ever since annexing the West Papua region in 1963, the Indonesia authorities have restricted access for foreign journalists because of acts of violence against civilians and the government’s crackdown on the separatist movements operating there. The few journalists managing to visit the region, which is an information “black hole,” have been closely watched. On 10 May, Jokowi announced the lifting of the ban on foreign journalists going to the West Papua region. The opening of Indonesia’s most secret region to journalists was one of the campaign promises made by Jokowi, who even told journalists that “there’s nothing to hide”. The decision allowed New Zealand’s Maori TV to do a report on the ethnic Papuan community for its “Native Affairs” programme. This was the first report of this kind in more than 50 years. But there is no guarantee of lasting access to information in the region. Certain army factions that have profited from Indonesia’s occupation are expected to continue to oppose media coverage. It is also highly unlikely that the authorities will let journalists investigate all the human rights violations that have taken place since annexation. Jokowi’s announcement – made while Indonesia was in the international spotlight following the death sentences pass on seven foreigners for drug trafficking – has all the hallmarks of a smokescreen designed to fob off international public opinion and add some temporary gloss to Indonesia’s image. While foreign reporters are no longer openly targeted in the West Papua region, the authorities still have their fixers and sources in their sights. Two fixers working for a French journalist were arrested and questioned by the police at the start of this month. The authorities also restrict the freedom of local journalists. Abeth You, a reporter for the TabloidJubi.com website, was attacked by police on 8 October while covering a demonstration in Jayapura, the West Papua region’s biggest city. It was organized by Solidarity for Victims of Human Rights Violations in Papua. After the police bundled You into a truck, an officer seized his camera and deleted all his photos – all the while threatening him with his gun. Even when they have press cards, local journalists covering demonstrations continue to be treated by the police as demonstrators. Coverage of certain sensitive subjects also continues to be closely controlled in the rest of Indonesia. British journalists Rebecca Prosser and Neil Bonner are still awaiting a verdict in their trial after being arrested for reportedly filming a reenaction of pirates attacking an oil tanker in the Malacca Strait, near Singapore. Rear Admiral Taufiqurrahman said shortly after their arrest that “what they were reenacting (…) could tarnish the image of the Malacca Strait as a crime-prone area.” The two journalists have been held since May under Indonesia’s immigration laws. In a couple of months, we will know whether Jokowi’s presidency has caused Indonesia to fall in the 2016 Reporters Without Borders press freedom index. 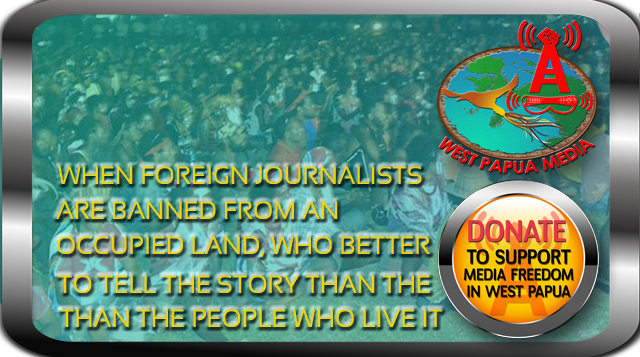 WestPapuaMedia is greatly concerned that the statements made on May 9 by Indonesian President Joko (Jokowi) Widodo in Jayapura regarding the ending of the foreign media ban for journalists to visit West Papua, is not being given due diligence by foreign media, and reminds all foreign media workers that West Papua is and still remains an incredibly dangerous place for journalists to report, and present an even greater threat to the safety of all journalism sources. A full analysis of the actuality of the so-called “lifting” of the foreign media ban in West Papua will be released by West Papua Media’s team in the coming days, including analysis from our clandestine journalists who operate daily in the reality of the Papuan media environment, under threat constantly from Indonesian security forces. Despite Jokowi’s graceful and well executed “Juru Bicara” (Straight Talking) image, the reality on the ground in West Papua is that he has little control over the actions of security forces. In west Papua. Journalists, media workers, fixers and sources are routinely denied access, harassed, surveilled physically and electronically,, threatened, arrested, monstered, beaten, disappeared and even murdered by all the various organs of Indonesian colonial control in West Papua, with a list of perpetrators including (but not limited to) Police, Australian Trained Detachment 88 anti-terror commandos, military, National Intelligence Body (BIN), military intelligence, police intelligence, Kopassus special forces, Air Force, Navy, Marine Corps, forestry officials, customs, immigration, mining officials, Indonesian bureaucrats, pro-Jakarta transmigrant militias, and the ever-present Ojek (motorbike taxi) riders / intelligence officers. The media freedom status in West Papua reached its lowest point in 2011, due to a series of murders, stabbings and disappearances of journalists across West Papua This situation that prompted Reporters Without Borders to rank Indonesia at 146 out of 180 in the World Press Freedom Index, only climbing to 139th place for 2014, due to international monitoring led by West Papua Media and our network partners in West Papua. This lifting of the foreign media ban is completely without power or credibility until both a formal Presidential Instruction is made, together with a national law is passed and enforced that penalizes anyone who prevents free, full and unfettered access for ALL media workers in Papua. Jokowi’s real attitude is telling however. Just a few hours later in Merauke, he was quoted in Antara with his real attitude to “media freedom” in West Papua. “Don’t ask that question, that’s enough,” Antara quoted Jokowi saying when he was asked about a fact that usually foreign journalists prefer to cover activities of illegal armed groups. 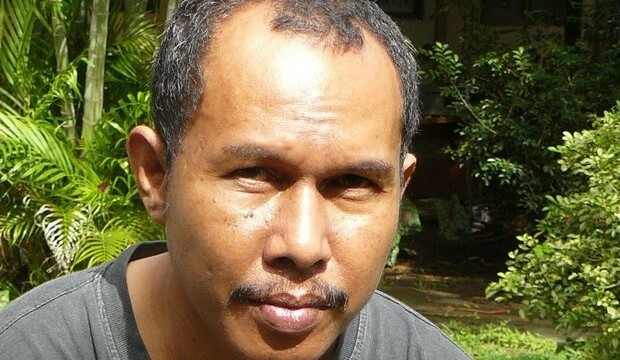 Operating in West Papua for journalists will remain an extremely dangerous activity. Even though it is unlikely a foreign journalist will be physically harmed it is not unknown. Foreign journalists have been beaten, poisoned, interrogated, and some have died in highly suspicious circumstances in the past. However, it is journalists’ sources that are most at risk, especially if communications and data are left unsecured. All journalists have an unbreakable ethical duty to ensure the safety of sources, and without specific technologies used. West Papua Media has a suite of digital and practical technologies developed from our Safe Witness Journalism training units, and we also can provide secure handsets for journalists travelling to West Papua. West Papua Media also can provide an unparalleled secure fixing service that ensures foreign journalists are fully briefed to the security situation in all parts of Papua, and to be able to report without putting any sources at risk. Last August, one person died, many went into hiding, and 5 were arrested due to unsecured data, notes, emails and phone calls allegedly held by the two French journalists arrested in Wamena in August, against the express guarantees on source security given to West Papua Media. Only journalists can prevent their sources being put in danger. Make no mistake, Indonesian occupation forces will harm journalists’ sources and journalists seeking to report on human rights abuses and violations of freedom of expression. We suggest all journalists seeking to report on Papua read our Source Protection Policy for more information, and contact us to arrange training for full data and communications security for mobile journalism. WPM also offers the ONLY civil resistance coverage media safety training available, which we can arrange for a reasonable cost. However, WPM remains sceptical on the latest claims of lifting the foreign media ban. There have been too many previous claims that this will end, including several by Jokowi himself. Let’s wait and see how and if the security forces even listen to their president. Will the most outspoken foreign journalists be allowed to report from West Papua with full media freedom and access? A large number of Independent and Mainstream Journalists who have previously reported inside West Papua have been threatened and banned from WP by security forces – will our bans be lifted? Journalists who seek to report on topics opposed by government or security forces must be allowed full and free access without let, danger or hindrance from security forces. To reiterate, until these minimum conditions are guaranteed by an actual InPres (Presidential Instruction) in law, with penalties enforced for any official that prevents or ignores it, then this is just an utterance. Of course, letting in foreign journalists who don’t believe the hype, who are currently on charge or banned from West Papua by Indonesia will be the real test. And making sure that the police and military answer critical questions when they kill civilians is part of that (including not hanging up on phone calls from WPM). It is highly unlikely that the State Violence Forces are going to suddenly stop tailing and harming journalists, human rights defenders and media workers, unless they are arrested for it. WPM will still operate with great scepticism the alleged lifting of the Foreign media Ban in West Papua, and about anything Jakarta (or any government) ever says: that is the job of journalism. WPM will still need to operate clandestinely, and we will still need support to train and supply people for safe witness journalism. Now more than ever, West Papua Media needs you support to train and supply independent clandestine journalists with the tools to safely report from the ground in West Papua. It costs $3000 to support one journalist with secure and robust equipment for mobile newsgathering, $3000 to provide intensive Safe Witness Journalism training. You can help by visiting this page to make a donation or longer term support. This alleged end of the media ban is stage-managed and not at all genuine. As far as we are concerned, the Papua Media Blackout remains firmly in place. Jayapura, Jubi – Chairman of Journalists Alliance (AJI) in Jayapura city, Victor Mambor, said it is very important to open access to foreign journalists into Papua in order to avoid misinterpretations of Papua. The issue was delivered by Victor in an interview with AJI Indonesia in Jakarta at the World Press Freedom Day (WPFD) 2015, Tuesday (29/04/2015). Victor explained that the media in Papua continues to grow, but the challenges are also growing ranging from human resources, financial, ethical and positioning journalists. In Papua, as the media grows, so too is the presence of journalists. “However it is true that a journalist in skill and ethics cannot always grow in parallel. If there are challenges, there is still not much of a significant change. Journalists still face threats of violence with the same quality as in previous years,” said Victor. Papua which is broad and extensive, has become the greatest difficulty faced by foreign journalists. The conditions make the confirmation process, covering both sides, and verification difficult. Often, news from Papua becomes incomplete and with bias ruling. “Every year there are 4 or 5 foreign journalists who question to myself regarding the situation in Papua. Most of them could not enter Papua. From their information, I can conclude they are not well served when submitting an application for reporting in Papua. In fact, there is no decision ever made, permitted or not,” said Victor. Victor said that the more closed the access is, the more questions the international community will ask about what is happening in Papua. “The conflict in Papua could be clarified in a comprehensive manner to the public through information which is submitted by journalists,” said Victor, who is also the Chief Editor of Jubi News and Jubi Online. He said, to open access for foreign journalists into Papua, the issue that is very important and must be carried is the clarification of regulations for foreign journalists in Papua. “Besides the campaign for open access for foreign journalists in Papua, lobby stakeholders who are related to the issue that need to be carry out the goal of clarifying regulations for foreign journalists. This is the main problem, unclear regulations,” he asserted.